to Kiya's babies - teaching them manners ! 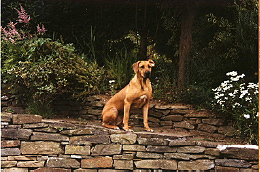 Kara was diagnosed with an inoperable tumour, in her hind leg, in October 2001. In January 2004 her tumour started to cause her serious illness and high temperatures. This could no longer be controlled by antibiotics and homeopathy and her future health was in serious doubt. by the specialists, Kara underwent radical surgery to amputate her whole leg. The operation itself took four and a half hours and she was in hospital for 4 days. The pathology results confirmed the tumour was benign and her prognosis for the future - promising. in the fields. It is a joy to see her healthy again and so obviously loving life to the full once more. to the other 5 family members whether they wanted to hear or not! Kara's home and with a healthy future ahead of her - we're overjoyed to have her back! Kara passed away in her sleep, peacefully during the night. adjoining the nursery - and dragged me at a pace all the way home when she'd decided she had walked far enough. Her unexpected crossing has taken us all with complete surprise and has left us in shock. Our beautiful "Kara" - Tukela Cazulu - forever greatly loved and always missed !